When the Justice League: War direct-to-video movie was released, I found it odd that Shazam became one of the founding members of the Justice League. After some research, I did find out that Aquaman was actually in the New 52 comic book story and Shazam actually took Aquaman’s place. Not sure why he was taken out. Maybe because people always comment on what a joke Aquaman is? Whatever the reason, DC decided to add Aquaman into the fold with their latest direct-to-video animated film, Justice League: Throne of Atlantis. This review will contain some MINOR SPOILERS. No major plot reveals will be mentioned but there are some thing that I have to specifically mention to get my point across. Taking place after some time after the Darkseid’s attempted invasion of Earth in War, the Justice League has been recognized by the populace. However, aside from Cyborg, none of the heroes are really interested in being part of a team. As such, he is the only one available to investigate a mysterious attack on a submarine in the Atlantic. While this is happening, Arthur Curry is depressed about his father’s passing, totally oblivious to his destiny. I reviewed Justice League: War a little over a year ago and it was a great movie. That film had lots of great action and most of the characters are given time in the spotlight. Justice League: War was a great first outing so I had very high hopes DC could keep up the pace. Unfortunately, Throne of Atlantis falls incredibly short of my lofty expectations. The first thing I have to mention is Aquaman/Arthur Curry himself. I don’t know what his New 52 incarnation is like so I really wanted to see what the character is like. A re-introduction to Aquaman, if you will. Hey, they actually made Aquaman into a badass in the Flashpoint Paradox. Then again, that didn’t “happen” since the timeline was repaired… it’s a long story. But, anyway, I was hoping we would get an Aquaman like the one we saw in Flashpoint Paradox. We sort of got this strange middle ground between “wimpy” and “badass” Aquaman in Throne of Atlantis. While he is tough and good at fighting (because he’s the son of a lighthouse technician? I don’t get it), we don’t really get to see him do anything spectacular. Also, his transition from “ordinary guy who just so happens to have super tough skin” to “rightful ruler of the lost kingdom of Atlantis” was incredibly fast. I just didn’t buy it. Another issue I found with the movie is the bad guys just didn’t seem threatening. Okay, Ocean Master and Black Manta had it tough as they were following Darkseid and the forces of Apokalips. 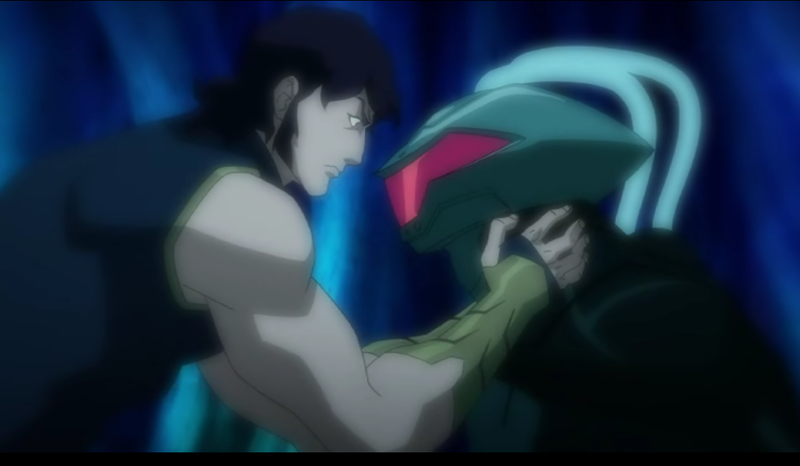 I didn’t feel that any of the Justice League were in any danger like I did in Justice League: War. Oh, sure, I know nothing was really going to happen to them but I should be afraid that one of them was going to be seriously injured, at least. What? Are you two going to kiss? The fight scenes are passable but nothing great. I can’t help but compare them to the action sequences in War since Throne of Atlantis is a sequel to that film. Like I said, I never felt that any of the heroes were in any danger like in War. Even though they were showing huge battles with dozens of people dying, I never felt afraid for the welfare of the heroes which made them boring. Oddly enough, my favorite scenes of Justice League: Throne of Atlantis doesn’t involve the King of the Seven Seas or with the Atlantean storyline! It’s the scenes with the rest of the Justice League that were really good. We get to revisit the rivalry between Batman and Green Lantern from War. We get a couple of scenes where Shazam and Cyborg start to bond with each other. And I would be remiss if I didn’t mention the possible romance blooming between Superman and Wonder Woman. Unfortunately, all of those scenes take place during the first third of Throne of Atlantis and they’re never touched on again. I really would’ve wanted to see more of this so we can actually see the team attempt to become a cohesive unit. 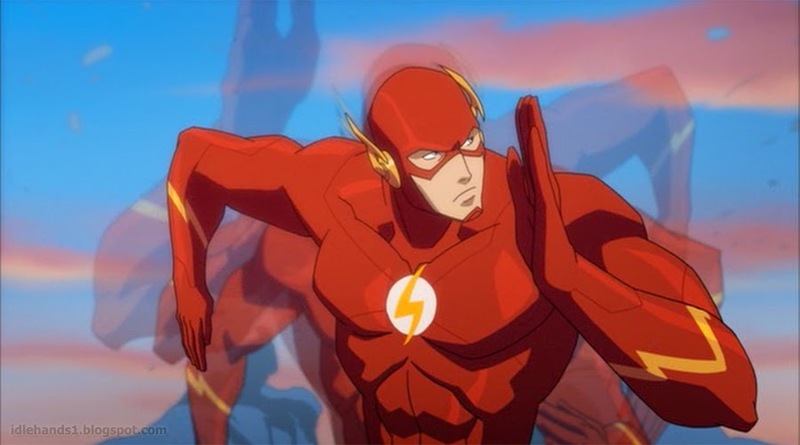 And, like in Justice League: War, The Flash is not given much screen time or character development. What’s up with that? The voice acting is pretty good for the most part. While I’ve been hating on Aquaman, Ocean Master and Black Manta, their voice actors nail the tone of each character. Mera and Queen Atlanna’s voice actresses also pull of good work as well. But, for me, the standouts are Green Lantern (Nathan Fillion hasn’t let me down yet! ), Shazam (Sean Astin manages to make his voice crack at just the right time) and Wonder Woman (Rosario Dawson makes her sound strong yet vulnerable at the same time). I would say my only problem with the voice work is Batman’s since Jason O’Mara sound like he’s trying to copy Christian Bale’s performance instead of making the character his own. Overall, Justice League: Throne of Atlantis is a huge step down from its predecessor. It’s watchable only because of the first third of the film. Otherwise, Aquaman’s first outing as a Justice League member in the New 52 universe is a bust. Hopefully, their next Justice League film will fare better. Have you seen Justice League: Throne of Atlantis? What did you think of it? Let me know in the comments section below!